Kim Edith is a textile artist, creator of stitch books and fabric collage extraordinaire! Her style and focus is clever, combining the skills she developed as an illustrator and (previously) a textiles teacher which allow her to create a wonderful world of fabric pictures, collages and fabric books. Chatting to Kim you can see how all the experience she has had in the past, from studying illustration to then teaching textiles, has helped on her journey – resulting in having a studio at The Hotwalls. 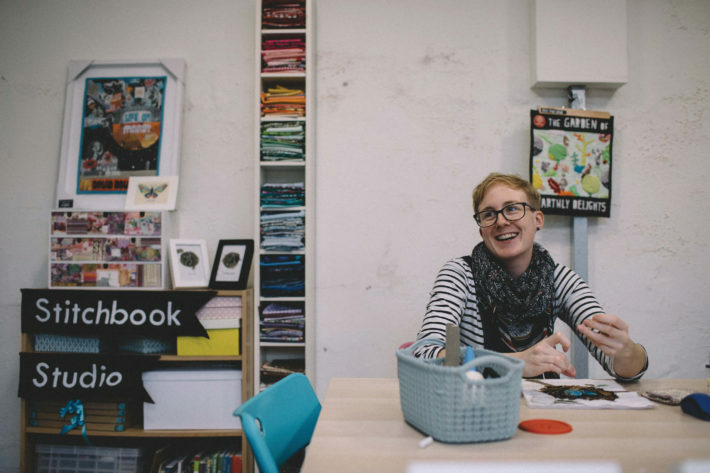 Looking around the white studio surrounded by piles of brightly coloured fabrics, you definitely get a feeling that Kim is in a happy place here down in the historical part of Old Portsmouth, surrounded by other creatives. Starting out by sharing a space allowed Kim to grow and gain support from her peers, which then helped her to get her own studio. Never underestimate the power of the creative community! Going back a few years after Kim had been teaching textiles, she decided to travel to America and worked with children who had a variety of learning difficulties; spending time in amazing wheelchair accessible treehouses. Doing nature hunts with them got her thinking of sensory ways to teach the children, and in those woods is where Kim first came up with the idea of a memory stitch book. Coming back to England and then working on the book in her spare time, Kim really loved the concept and got so much out of developing her first storybook ‘Into The Woods’. Taking a whole year to make this fabric stitch book by hand, Kim realised she wouldn’t be able to sell this as it took far too long to make and wasn’t commercially viable. Sharing a video on Facebook about the storybook created a huge demand for it to be available for the public to buy. With views of over 720,000, it was something the artist couldn’t ignore. Kim’s thoughts then turned to a book that looked visually like a fabric book but photographed in a way that it was actually paper. Coming up with this process has meant Kim has been able to share her love of the stitch book in a commercial way whilst retaining its heart and meeting demand. You can order the stitch book storybook on Kim’s website and priced at £12 it’s a lovely addition to anyone’s bookshelf, young or old. If you fancy making your own stitch book then Kim hosts 1-day workshops that provide an introduction to the craft; guiding you through the main skills needed including printing your photos onto fabric, adding text and constructing the pages. Trying out all the different techniques will give you the confidence and understanding to make your own book. There are also many other workshops priced between £30 and £60 which range from ‘Mini Collage Classes’ to ‘Hand – Applique Workshops’ so keep an eye out for those later this year. 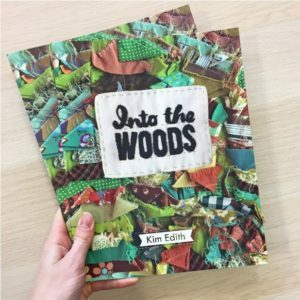 February sees Bookfest come to Portsmouth and as part of the celebrations Kim will be giving a talk about her creative journey in getting the hand-stitched, fabric book created into a print book. The cost to attend her talk is only £4.00, including a hot beverage and the chance to see other works by Kim as well as the famous original ‘Into The Woods’. Please look out to see if Kim produces a second book. It’s a labour of love and may take some time as it will be completely handcrafted but I have no doubt, it will be well worth the wait! Welcome to Southsea Folk Online. Brought to you by the team behind the magazine of the same name. Showcasing all that is great about our local businesses and most interesting of folks on this, our beautiful island. Here's your chance to join us in celebrating all that is great about Southsea and our wonderful independents. Here is the shortlist. Please make your votes count and thanks for your support.